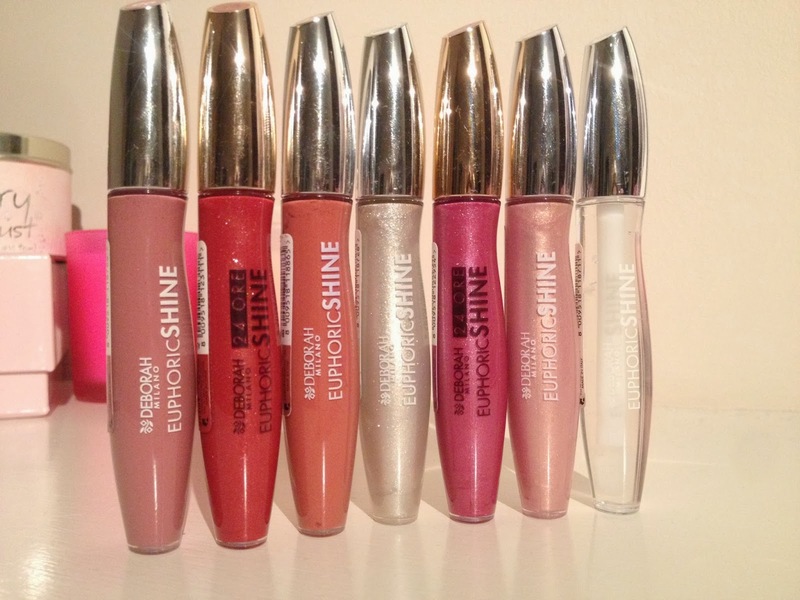 The lovely people over at Deborah Milano UK very kindly sent me some of their beautiful Euphoric Shine lipgloss and 24 Ore Euphoric Shine lip glosses for me to try. I have to say I was completely blown away with their generosity. Deborah Milano UK were one of my 'new found' brands of 2013 and a definite favourite as we begin 2014. I find their products to be of high quality and very reasonably priced. I have sampled some of the Deborah Milano lipsticks and eyeshadows in previous months and loved them. These lip glosses are gorgeous too. I was sent two from the '24 Ore' Euphoric range, No. 4 'Timeless Cassis' (sparkly plum) and No. 10 'Staying Scarlet' (ruby red). The 24 Ore Euphoric shine glosses come in 10 sensational shades, formulated with a lasting shine complex and they contain silver coated 'extra shine' pearls that portray a beautiful sparkle. 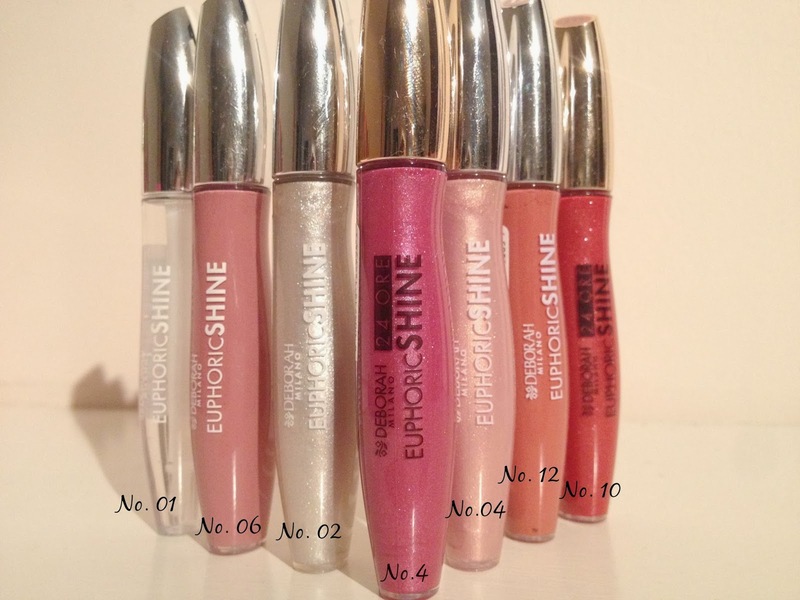 The next five glosses are from the 'Euphoric Shine' range and you are spoilt with 16 fantastic shades. These glosses are enriched with 'patented pearls', and enriched with Vitamins B & E for super soft, super shiny lips. No. 12 'Brick' (not the most flattering name however, this is a gorgeous rusty shade). I adore all of these glosses my personal favourites being Staying Scarlet and Platinum. They are hypoallergenic and give my lips long lasting hydration. The formula lasts a long time and even if the glossiness wears off, the colour and sparkle stays. These are non sticky which is an added bonus. These little gems retail for £3.75. Simply use voucher code FREEGLOSS on check out. I love the look of 6 :) Never heard of the brand though - oops!